Lawn Mower, Lawn Tractor or Garden Tractor? 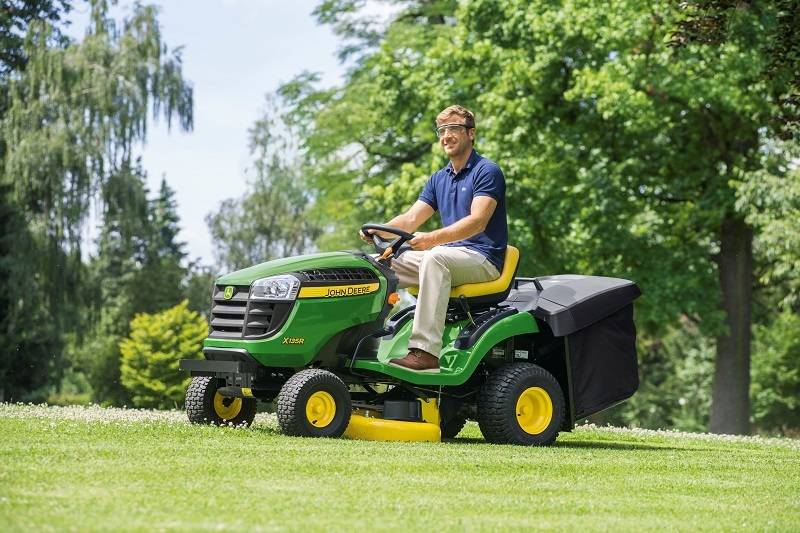 Should you buy a riding lawn mower, a lawn tractor or a garden tractor? While the lawn tractor has some nice attachments, you may find yourself wearing out your lawn tractor with frequent use of attachments, where more power would give you better performance. Whether you have a big yard, or a bit of acreage, you may find the old lawn mower just isn’t sufficient. If you have an interest in gardening or changing your landscape, there are some advantages to having a tractor. Let’s start with the size of the property you will be actually working. A riding lawn mower is fine to tend a large lot of lawn. For a little acreage, or if you are putting in a new lawn, a lawn tractor that accepts attachments can help level and aerate the soil, can plow some snow along the drive and help to maintain the lawn. For more than five acres or more extensive landscaping, such as large flowerbeds and vegetable gardens, a garden tractor may be better. A garden tractor is a smaller version of a farm tractor, available in a range of horsepower and sizes, with a three point hitch on the back for attaching tools. If you will be planting some trees, moving shrubs, or erecting fences, the tractor can be a great help. Tractors have a three point hitch and power take off (PTO) which enable you to use power implements to mow (bush hog or finish mower), contour ground (box blade), disc the dirt, till, furrow, dig post holes or tree planting holes (auger), scoop dirt (or rocks, mulch, etc. ), thatch, snow plow, and haul a power sprayer or trailer. Many have enough power for miscellaneous chores in addition. There are still a few small tractors that have a special smaller hitch – it’s best to stick with the standard 3-point hitch that accepts all standard attachments. Implements for a standard 3-point hitch are available from stores such as Tractor Supply and Quality Farm and Garden, as well as many feed stores, Sears, and tractor dealerships. Also, A number of rental businesses have tractor attachments available – and some even have the tractors, if you feel you only need one for a short while. As with renting any tool or equipment, be sure you also have the right attachments with it to do the job, and be aware that it may not be as good a quality as you would purchase. Spend time at any feed store and you are bound to meet folks with tractors, and many will share their opinions with you. You want to be sure to get one with the weight and power to do the jobs you want, and preferably a model with readily available parts and repair service. Be aware that the smallest models of garden tractors have the PTO and 3-point hitch, but may lack the power and weight to do extensive land work or heavier jobs; be realistic about what you want to do and the size of machine and motor that can handle it. The popular names such as John Deere tend to be the most expensive. Other popular models are from Ford and New Holland, Cub Cadet (International), and Kubota. These companies manufacture everything from riding lawn mowers on up to the huge custom farm machines with TVs and air conditioned cabins. Some of the smaller models also offer a choice of gasoline or diesel engines. If you are handy mechanically and your needs are not too heavy, a gasoline engine may suit your needs. For heavier workloads and more extended use (more than 5 acres), you probably would do well to strongly consider the diesel engine. The diesel engine produces more power for it’s size, and has a reputation for long-term reliability. Which one for you? Optimally you’ll want to get a little more power than you think you’ll need, so that you don’t put a constant strain on your tractor. Shop several dealers and compare features, of course – but try to buy the most power you can within your budget and working requirements. Over five acres, and with a small garden plot – try for a tractor with at least 25hp and get as wide a bushhog or mowing deck as you can! Soon enough you’ll be finding new uses for your tractor and checking the bulletin board at the feed store for attachments. I like that you mention taking into account the size of your lawn when buying a new mower. My husband and I just bought a new house that has a much bigger lawn than our own house. We have a pretty small mower so we’ll have to look into buying a bigger one to get the job done right.